What’s a woman to do, in a world gone mad? The Three Muses Challenge this week is steampunkerie. I love steampunk, but wasn’t sure I’d have images that would work in my pile of magazine and junk mail clippings. I sifted through and found some things that seemed to fit when they were all put together in my collage journal. If you’re interested in reading some steampunk, you might like Boneshaker by Cherie Priest. I enjoyed the Audible version. This entry was posted in Arts & Crafts and tagged challenges, collage on March 30, 2011 by admin. The Three Muses have invited us to visit the Land of Odd with our art this week. I pretty much live there most of the time, anyway! I had fun bringing this gal to life. It took me a while to find just the right words in my pile of magazine clippings, but when I found them I knew there were the ones. This is also my entry for this week’s Whimsical Wednesday. 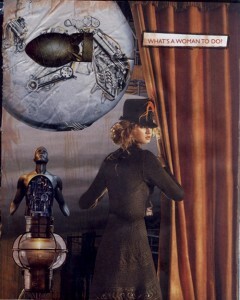 This entry was posted in Arts & Crafts and tagged challenges, collages on March 23, 2011 by admin. This week’s Take a Word theme is Architecture. 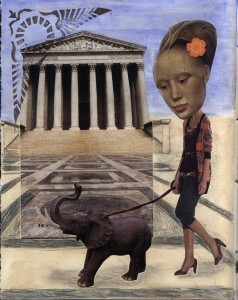 This is collage, paint, pencil and a hand carved stamp in my collage journal. Click the image to enlarge it. Love this theme, so I’m off to see what everyone is making. This entry was posted in Arts & Crafts and tagged challenges, collage on March 21, 2011 by admin. 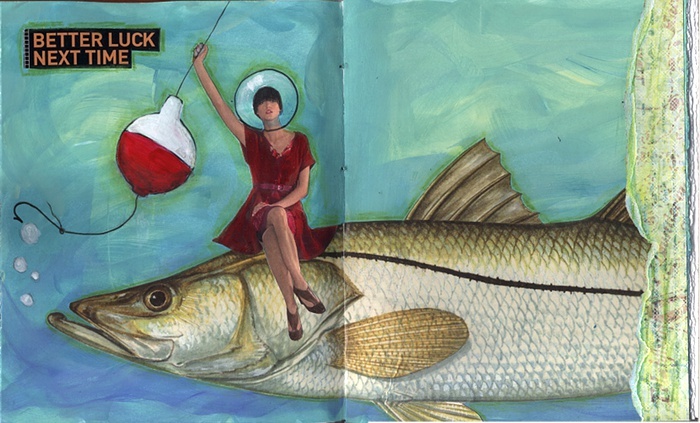 When I saw this week’s challenge theme of Fish over at Three Muses, I knew I wanted to make a page in my collage journal. I remembered saving this big fish image from a magazine way back. I glued in a friend to help him out and painted in a few details like the bobber and hook and bubbles. Then I looked through my box of words clipped from magazines to see if anything suited, but without really expecting to find anything. Better Luck Next Time just jumped out at me. Love me some fun fishy art! 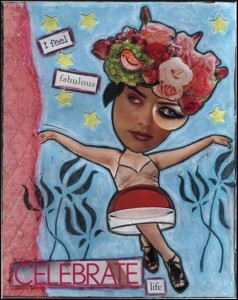 This entry was posted in Arts & Crafts and tagged challenges, collage on March 16, 2011 by admin. The monthly art challenge for March at Willowing & Artist Friends is bunnies, so I drew this little guy. This is watercolor pencil and Pitt pen in my sketchbook. 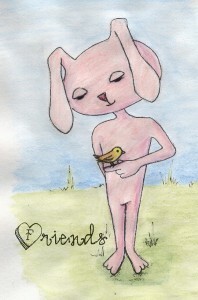 I added the word Friends digitally after scanning. I also plan to enter him for Whimsical Wednesday, which I just found. I can’t resist a challenge with a name like Whimsical Wednesday! This entry was posted in Arts & Crafts and tagged challenges, sketches on March 16, 2011 by admin.